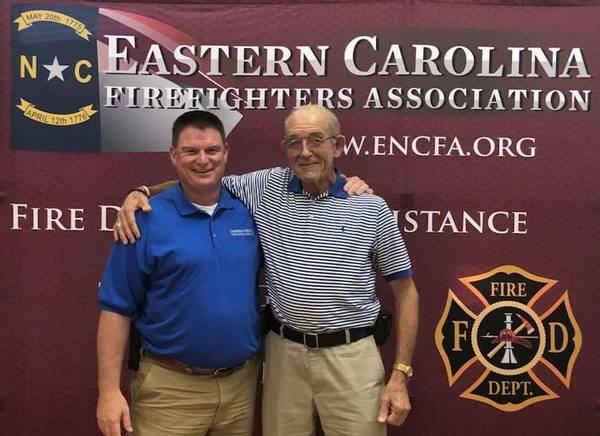 Alex Stanland, fire rescue weekend school coordinator at Cape Fear Community College, was recently honored by the ECFA. The Association named one of the General Education Scholarships in his name. That scholarship is in the amount of $1,500. Stanland joins other Eastern Carolina fire service icons that have scholarships named for them. For many years when he wasn’t busy fighting fires as a Volunteer Chief, you could find Alex at the college coordinating fire rescue weekend schools. That’s where you can still find him today. On behalf of the ECFA and the thousands of students he’s helped impact through fire training, thank you! Scott Rogers (L) and Alex Stanland. Stanland now has an ECFA Scholarship named after him.